After all that efforts I would dearly love a drink (perhaps something which would go down well with Downton Abbey) sadly the one that I’m itching to try sounds both overly potent and a bit extravagant for an ordinary (albeit frustrating) Sunday. A nice cup of tea will do stand in duty but lacks something in the louche decadence department. A basic understanding of cocktails and their ordinary ingredients is a part of my job (drinking them isn’t in the description) and I’ve experimented with a few books over the years. The first thing I learned is that making cocktails isn’t as easy as I imagined – the method really matters. The second thing I learnt was that people drink some crap; cocktails go through some dire fashion cycles. Still its work, you have to do it and when I discovered margarita’s I thought I’d give the whole thing another whirl. The results were a lot better mostly due to carefully following instructions. This so far (and I’ve done a bit of research) is the best cocktail book I’ve found. It covers the basic recipes and technique both of which are vital, have those at your fingertips and everything else should come together. The technical information is spot on, I know - I had to sit an exam on this stuff, which would have been more fun to revise for if I’d had this book at the time. Mixed in with the practical bits are anecdotes about Bompas and Parr projects (the architectural punch bowl) improbable concoctions (a cocktail made with ambergris which as the authors point out is bitchingly expensive, another with ether which would certainly fulfil the requirements for louche and degenerate – what sort of hangover would ether inflict?) the postmodern (buckie milkshakes) and tricks of the trade (things involving cream whipper’s which are probably only really for professional use, and found in the sort of bars you don’t really get this far from London– nice to know how it’s done though). There are also instructions for Sabrage – the art of cracking open a bottle of champagne with a sabre. A kitchen knife is the suggested tool here if you lack a sabre but I’ve found in the past that a saw works well to – whatever comes first to hand. Sabrage is a party trick which shouldn’t impress but generally does, you need to make sure no one is in front of you, take a bottle of fizz and hold it by the bottom, line it up so that you have the seam of glass running up the bottle away from you, then take a reasonably weighty knife (sabre, or saw) and run it blunt side smoothly, swiftly, and with reasonable force down the bottle until you hit the lip of the neck. This is the weakest part of a bottle under tremendous force from the wine inside, if all goes according to plan the top snaps off cleanly (flying several feet) and you don’t spill too much. And as for the recipe I really want to try; Black Gin punch. A concoction of gin, vermouth, madeira, honey, pineapple, cinnamon, cloves, sugar, orange, lemon, and more, all to be served hot in a teacup. It sounds much more exotic than mulled wine, and much stronger. I can’t practically make it as the recipe stands but hope that I can produce a slightly watered down version in more manageable quantities. Wish me luck. 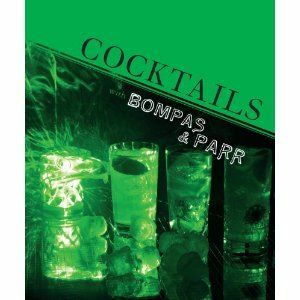 I've heard a lot about Bompas and Parr, especially their jellies! I'm not good at making cocktails but am good at drinking them;) Have you tried the Savoy Cocktail Book (with the lovely 30s illustrations)? I keep looking at and it. I find it safer to read about cocktails than drink them these days but this is a cracking book if you're interested in spirits generally and just a good read all round. I've spent a chunk of my afternoon off with a wine shop friend discussing the merits of getting a cream whipper so he can make flavoured foams - I'm keeping my fingers crossed he does it. So what do you think of Georgette Heyer? This is what bookshops are for. Jane Eyre – What’s it all about then?